Because of the possible need to accommodate a larger group, a new venue has been set for the NK Town Council to hear the Full-Day Kindergarten Report. The new venue is the North Kingstown High School cafeteria. The Town Council will discuss the report this MONDAY night from 6:30 to 7:30pm. Citizen’s comments are welcome. If you’re interested in speaking, please consider arriving at 6:00pm to coordinate comments. Thank you! 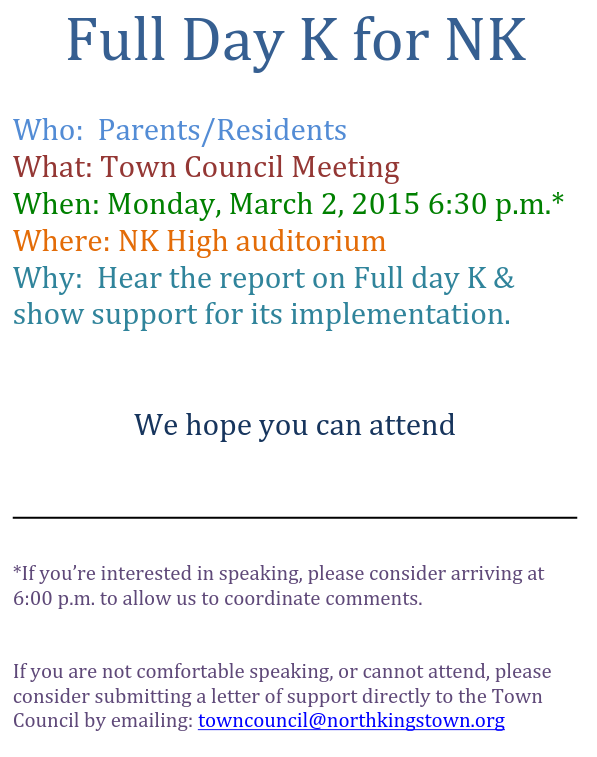 Click to see the NKSD Full Day K Feasibility Study! Send an email to all Town Council members expressing support for full-day Kindergarten.